Going boating with your friends and family can be a great time; however, when you add your puppy, it can be an even better one. At Freedom Boat Club, we have a few different boats that will offer you and your furry friend an opportunity to go boating together. For the full list of our watercrafts, check out our boats to find the right one for you and your pup. It’s important that you make sure that you prepare your dog to go boating since he or she may be a bit wary if they’ve never gone before. If you’re one to take your dog everywhere, then these tips will ensure that both of you have a fun time while boating on Lake Lanier. For more information about our boating memberships, reach out to us today. Many dogs enjoy swimming in the water and they are instinctive swimmers. While there are some dogs that don’t like the water, there’s a chance that yours does. The best way to find this out is to slowly introduce your furry friend to the water. In Boating Safety With Pets and How To Introduce Your Dog To Water, we went over some ways to keep your dog protected when you go boating. 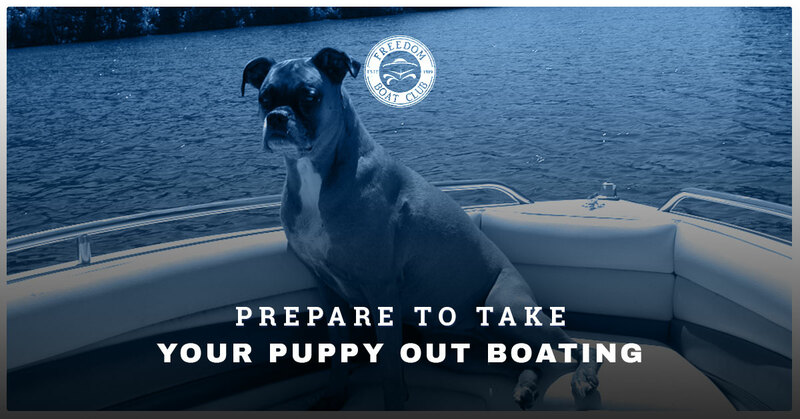 In today’s blog, we’ll be going over a few tips to prepare to take your puppy out boating. It’s vital that prepare your dog to go boating to make sure that he or she is comfortable to go on the water. While you’ll want to make sure to bring water for yourself, you’ll also want to bring water for your pup as well. If you’re planning on drinking two large waters, then bring another extra one for your dog as well. Even though the weather is finally tapering out, you’re still going to want to bring a lot of water to avoid dehydration. While you can perspire, dogs are unable to do so. Your pup will need to consume a lot of H20 to ensure that they are safe while hanging out in the blazing sun, especially because you don’t want them to drink the lake water. Are you going fishing? Are there are a lot of hooks hanging around on the boat? Will you be wakeboarding? Whatever your plan is, make sure that your equipment is away from the dog and in a safe place. If you’re planning on fishing, then you’ll want to make sure the bait isn’t eaten nor that the hooks get stepped on by your dog’s poor paws. It’s vital that you treat your boat the way you’d treat your home if you wanted to keep your dog away from certain things. The best way to follow this tip is to set your boat up before you take the dog on the boat to ensure that anything dangerous is put away. When you own a dog, positive reinforcement is everything. Did Mr. Peanut go to the bathroom outside? Great! He gets a treat. Did Fluffy stop chewing on your shoes? Awesome, she gets a treat. By taking treats with you on the boat, your dog will be on his or her best behavior. Additionally, if you bring treats, then your dog will be ready to do your bidding because you have something he or she likes. You’ll want to take a lot of treats since you’ll be out there for a whole day and going boating with your dog is very important to ensure that he or she obeys your commands. Life vests aren’t just ideal for humans, you can also purchase them for dogs. By purchasing a life jacket for your pooch, you don’t have to worry about if he or she falls overboard. Instead, you can just grab your dog from the water and hoist him or her back onto the boat before any real harm is sustained. A life jacket can be a great investment no matter if your dog likes or doesn’t like water. Just like wearing a life jacket for a human, it’ll help to make sure that you can get the person or dog out of the water and away from danger. If your dog hasn’t been exposed to water or if your dog doesn’t have a life jacket, we suggest holding off on going boating until you and your dog feel comfortable heading into the water. These are just some suggestions to make sure your dog is prepared to go on the water. While we encourage you to take your dog on the water, we also want to emphasize the importance of pet safety while boating. Are you ready to spend the rest of summer boating with your dog? We bet you are! Take the time to contact us to learn more about boating on Lake Lanier at Freedom Boat Club.